I will never forget my first encounter with rocotos. 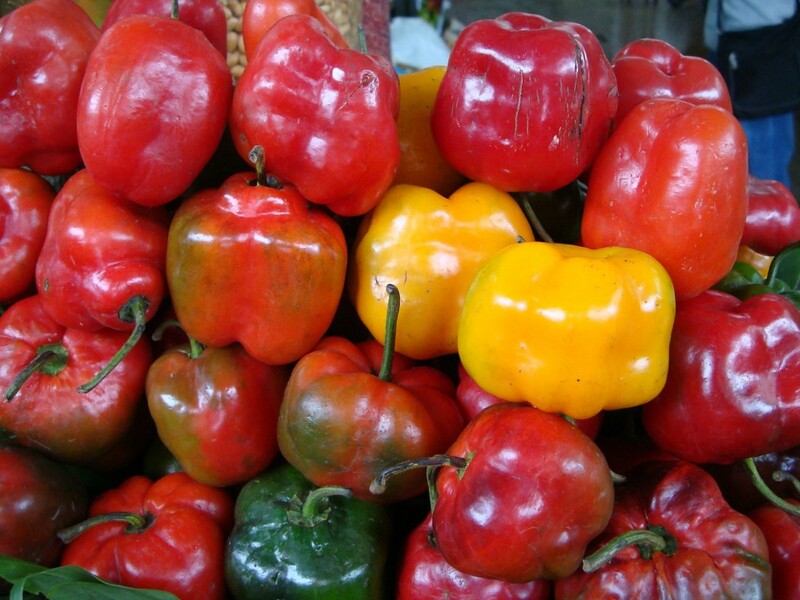 Recently moved to Peru and new to its food, I thought it was an innocent red bell pepper when I saw the thin slices in a salad bar. I never could have imagined that this was going to make me cry and barely breath, with my mouth on fire. I was not used to chili peppers, and especially to the extreme heat that made rocotos famous. Some people swear they can eat them fresh from the plant as apples, but I have never seen this… maybe that´s only when recently harvested. You can be sure that I won´t try this. Ever. 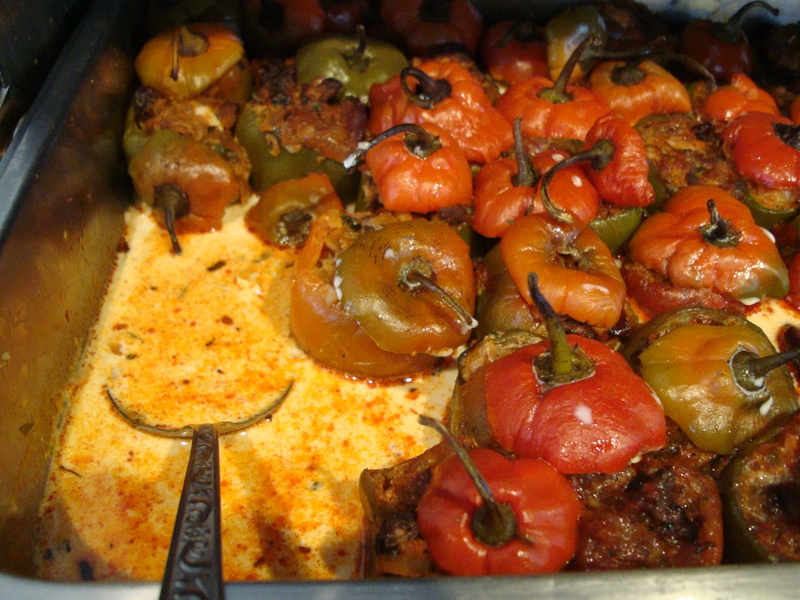 Based on my first traumatic experience, I avoided every preparation that included this chili pepper, (the emblematic rocotos rellenos –meat filled rocotos– in particular), thinking that the fiery vegetable would be unbearably hot again. 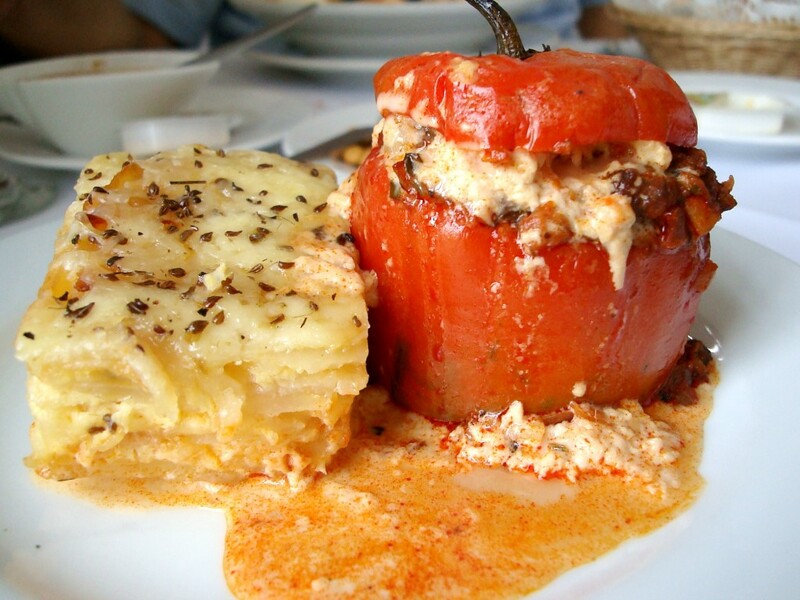 What I did love to indulge in was the potato gratin –Arequipa style- that is the usual accompaniment of this dish. Then one day, feeling adventorous, I tried the filling and thought it was delicious, full of complex flavors and not too spicy, and so I started eating this more often. I still left the rocoto untouched, though. 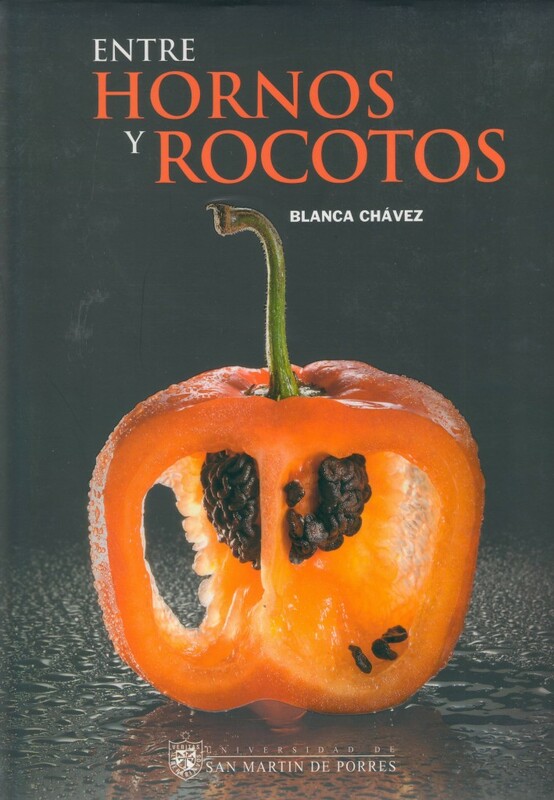 Until one fine day, as my palate grew more comfortable with heat and spicy ingredients -I have to confess that now I love chilies and spicy food-, I had a bite of the cooked rocoto, and to my surprise, liked it a lot. This time I didn’t find it overly hot, and I found that it had a very interesting flavor on its own, different from any other I had tried before. Cooks have some secrets to tame the heat of rocotos and make them edible for everyone. The basic one is to clean the inside of the rocotos thoroughly with a spoon, removing seeds and veins, which is where the heat is stronger. The following steps can be: 1.- Boil the rocotos three times with fresh water and sugar, changing the water every time; 2.- Soak overnight in a mixture of vinegar and sugar. The next day, drain them, wash them very well, and boil for 5 minutes covered in water and the juice of two limes. Drain and rinse them.This is Blanca Chávez‘s (one of Arequipa‘s most famous chefs) favorite method. 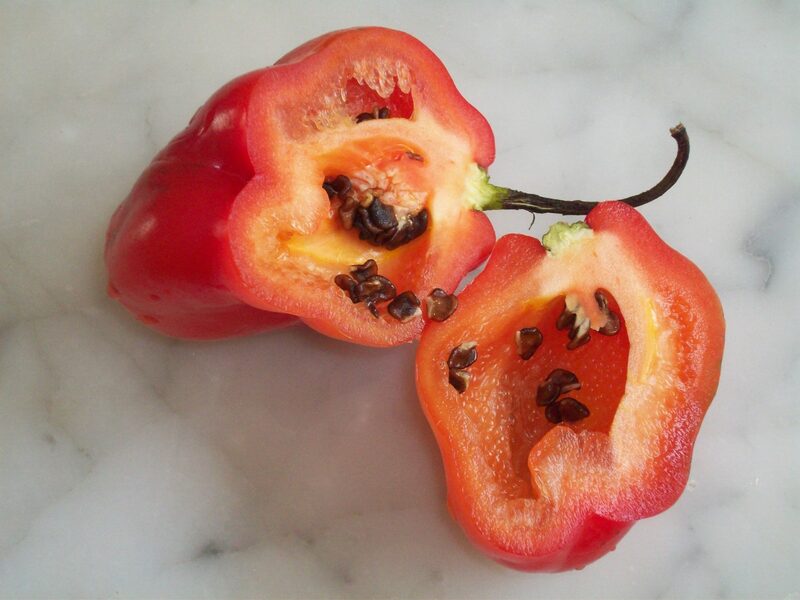 3.- Put a good amount of salt inside each rocoto and with the help of a spoon, scrub very well and then rinse them. Whichever the way you choose, the result must be the same: ready to cook rocotos, withouth life-threatening heat. 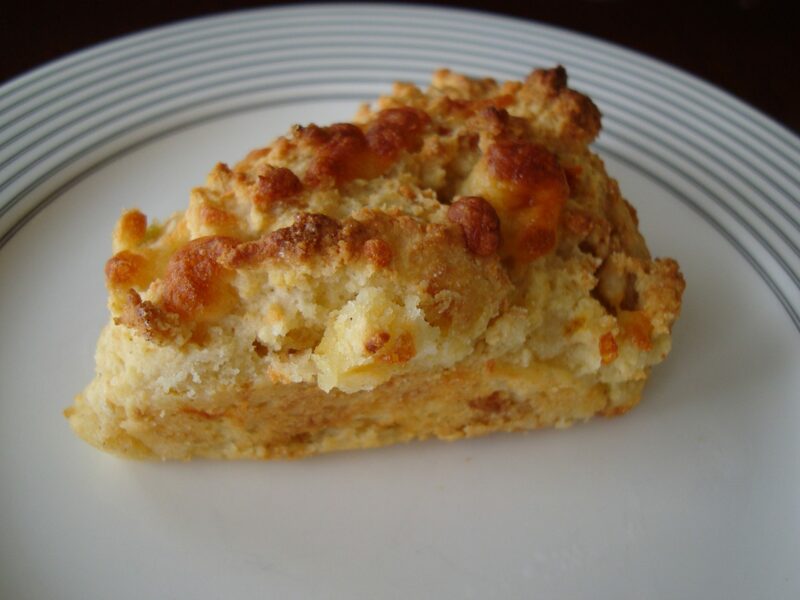 This recipe is from one of my beloved cookbooks, Entre Hornos y Rocotos, by Blanca Chávez. 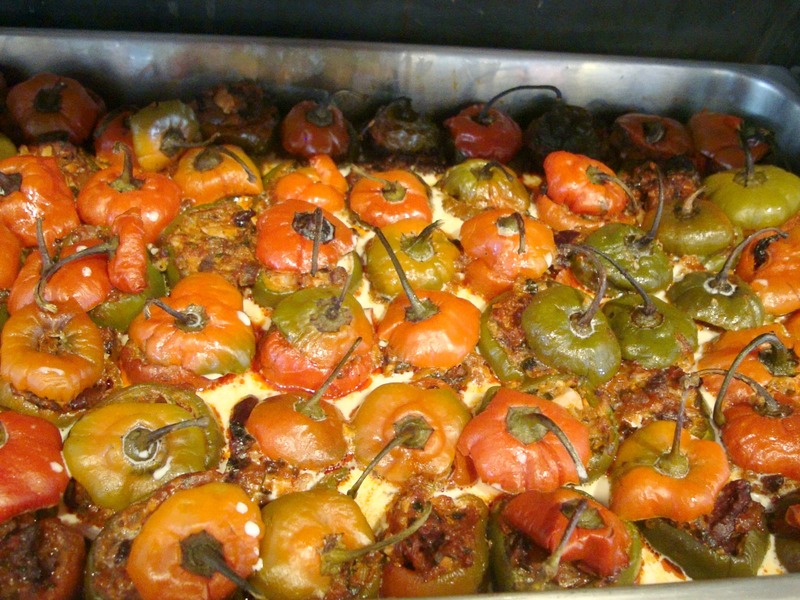 I´ve had wonderful rocotos rellenos in her restaurant, El Rocoto, in Lima. Her son, who is the chef at her restaurant, taught me how to know when rocotos are effectively loosing their heat: when boiling them it´s difficult to breath in the kitchen at first, but after changing the water and boiling again, when you can start breathing normally, they are ready. Easy, right? Another secret: the meat for the filling should be chopped, not ground. Feel free to use ground beef if you prefer, but the original recipe is with chopped beef. Some cooks use shrimps or chicken in the preparation. Either way its wonderful. What I can´t give you is a substitution for the rocotos, and I know how difficult it is to find them overseas. But maybe you have a supermarket in your neighborhood that carries frozen rocotos… Then, by all means buy them and try this amazing dish. 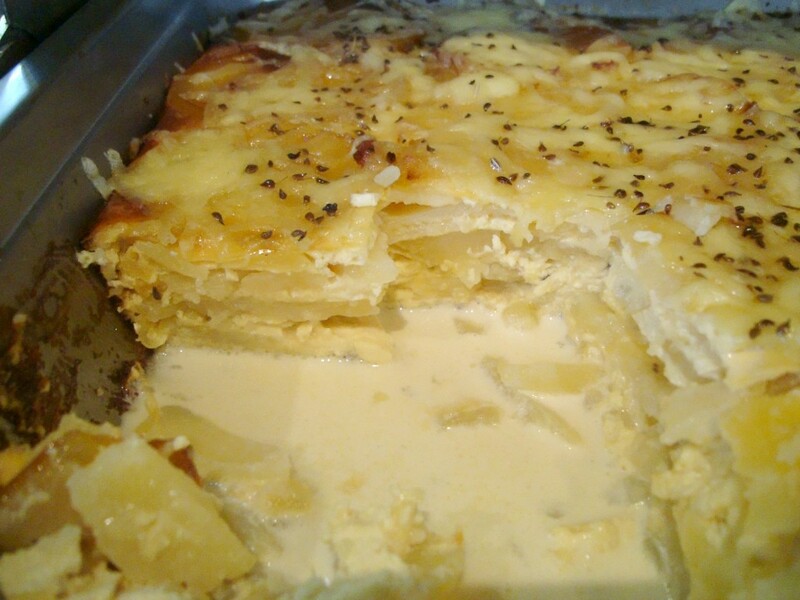 But there’s no real reason to miss out on the potato gratin even if you can’t find the rocotos. 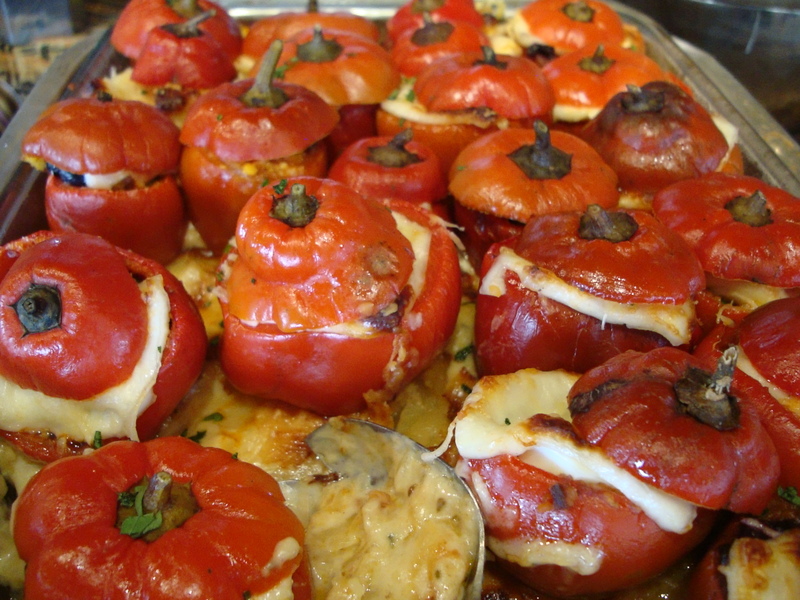 This is a delicious meal by itself, or you can have it next to a mixed salad, or even better, next to a red bell pepper or large beef tomatoes filled with the rocoto relleno chopped beef filling. 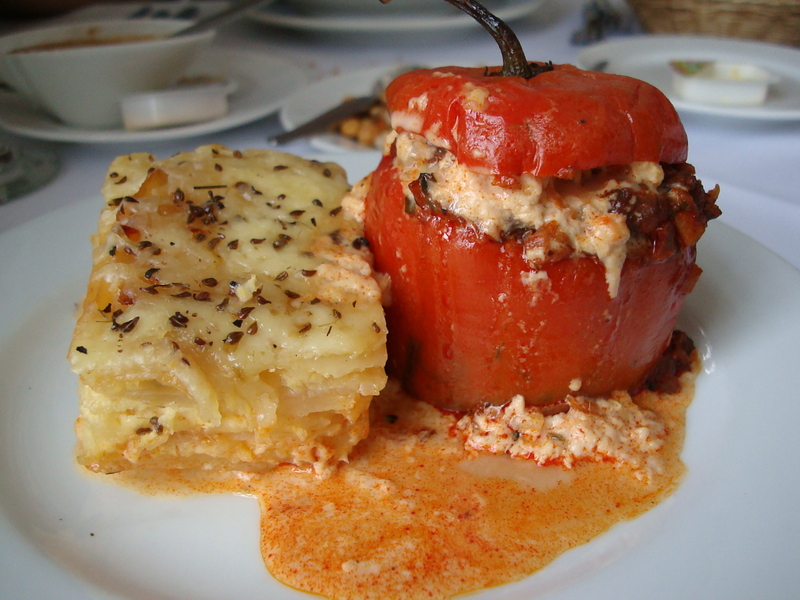 One more secret about this traditional hearty dish that is actually enjoyed as an appetizer? 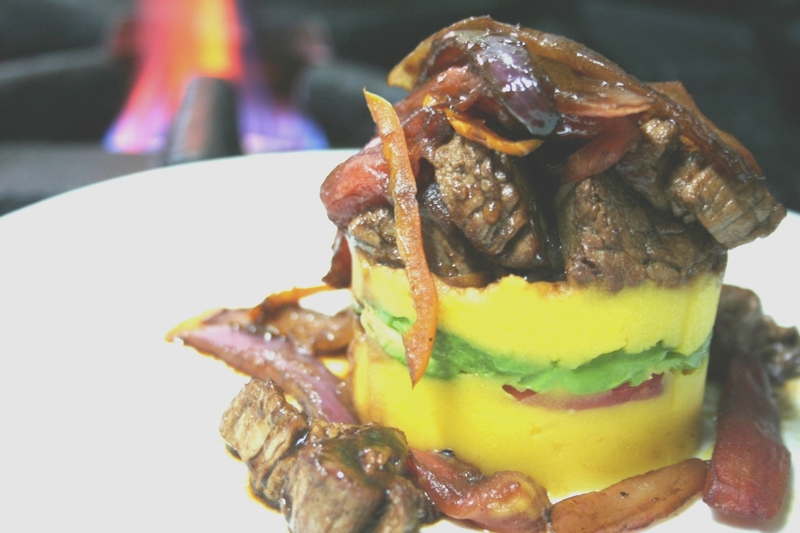 (Peruvians have large stomachs! ): some people say rocotos rellenos represent the fiery Misti volcano from the region, and are extremely aphrodisiac. Get ready for a dish full of burning passion! To tame the heat of the rocotos, cut the top of each one and using a spoon scrape the seeds and ribs from the inside. Be very careful, and it´s wise to use gloves to protect your hands, and wash them well when you finish. DO NOT touch your eyes! Put the rocotos in a pan with water to cover, a tablespoon of sugar, bring to a boil, turn off the heat, discard the water. Add more fresh water and repeat this operation three times. Drain and cool the rocotos. Reserve. Meanwhile, in a saucepan over high heat, warm the oil, add the aji panca paste, beef and bay leaves. When cooked, add the onion, ¼ teaspoon sugar, salt and pepper. Add the peanuts, oregano, olives, hard-boiled eggs, parsley, raisins, salt and pepper. Fill the rocotos with this mixture. Accommodate in a rectangular or square pyrex or baking pan. In a bowl, beat one egg with one can of evaporated milk, salt and pepper, and pour over the rocotos. Beat two eggs until very thick and put a tablespoon over each rocoto. Then cover with the reserved tops. Bake for 15 minutes in a 350F oven. 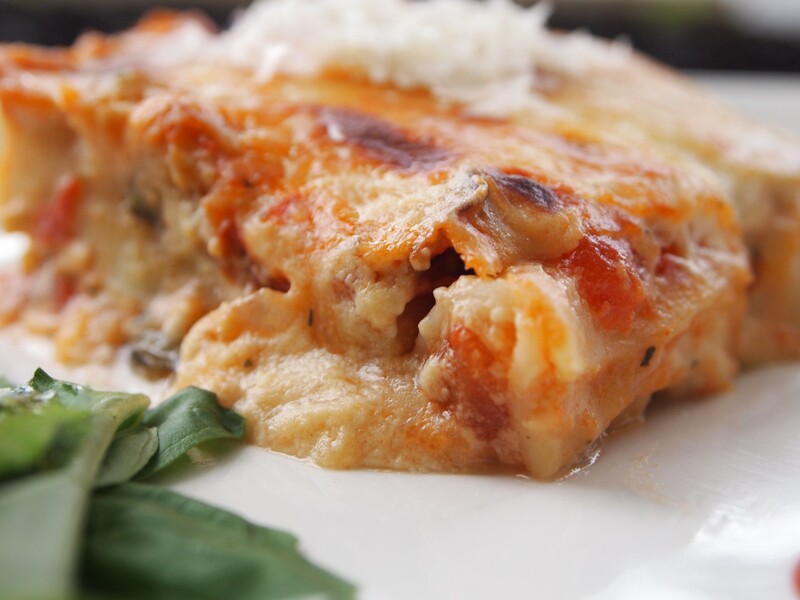 Serve with the potato gratin. 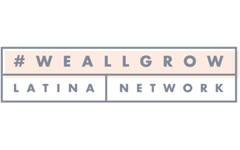 To make the potato gratin: Butter a baking pan or a pyrex, make one layer of potato slices, cover with queso fresco and a sprinkling of aniseed. Repeat three times. In a bowl whip the four eggs until very thick, add evaporated milk, salt and pepper. Pour over the potatoes and cheese. Bake in a 350F oven until golden and thick.